November 26, 2012 /Photography News/ A Leica M3D owned by former LIFE photographer David Douglas Duncan has become the most expensive camera from a serial production at the latest WestLicht Photographic Auction in Austria. David Douglas Duncan is best known for his dramatic combat photographs of Korean and Vietnam War and his work with his close friend Pablo Picasso. As a result of this friendship seven books were published, all photographs were taken with the Leica M3D. Duncan's M3D had an opening bid price of €150,000, but went on to fetch €1,680,000 ($2.66 million) becoming the most expensive camera from a serial production ever sold. Manufactured in 1955, the camera is one of four ever made, and the price is a world record for a commercially produced camera. 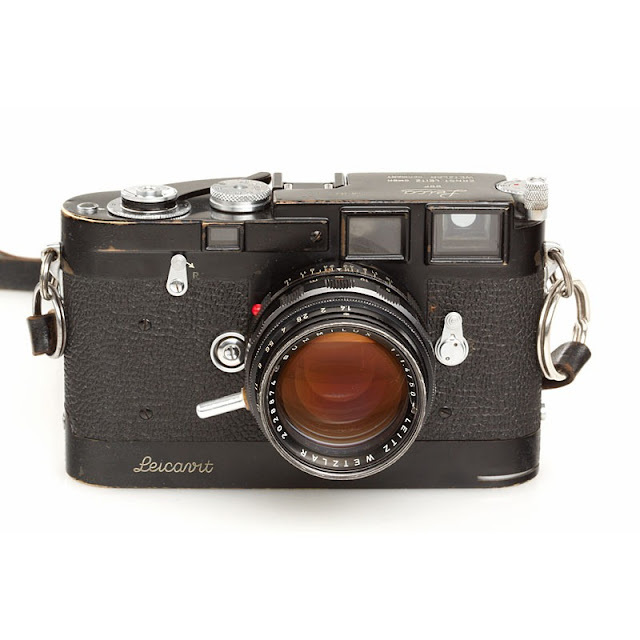 David Douglas Duncan's Leica M3D is also the second-highest price ever paid for a camera. Two other cameras from a serial production sold at the WestLicht auction: a gold-plated ‘Luxus’ Leica dated 1929 sold for 1,020,000 Euro, and the very first serial-production M3 (1953, serial number 700001) formerly owned by Willi Stein, chief engineer of Leitz, sold for 900,000 Euro. It looks to be f/1.4, which is quite fast for 1955 (or anytime!) on a 50-mm lens. My latest camera is a Canon G15 with a f/1.8 zoom lens, very fine considering it folds up in an instant upon command and disappears inside the camera! With the instant ISO ceiling digitally, the camera will capture fine B&W as if it were shooting at f/1.4 with no problem. In fact, this may be the best small camera in the world at the moment and will, I wager, out-produce DDD’s old Leica brick without batting an eye. It cost 48,000 times less in dollars, too. So, what's special? It has the clip-on crank to the rewind knob; it has no self-timer; it has an obsolete frame counter surrounding the lever wind spindle; a Leicavit rapid-stroke film advance base; a home-made peg in the lens mount for finger-tip focusing, and a Schwalberg strap. I have one of those, given to me in person by Bob himself in 1968 or so.